Få enkel transport till Bratislava slottet i en gammaldags Presporacik med en konvertibel topp. Styr tränaren i Hviezdoslavovo-torget och kör genom Gamla stan, som passerar populära sevärdheter som den upp och ner pyramiden, Slovak National Theater och mycket mer. På Bratislava slott går du runt grunderna och njuter av den natursköna utsikten. Worth it especially if you're short on time. The tour stops for 20 minutes at the castle where you can stroll around and take pictures. There is audio commentary throughout and it points out important buildings and landmarks as you make your way to the castle. 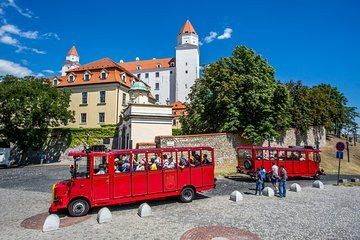 This was a very nice way to see the city and travel up to the Castle, especially in the winter! Time was just about right to see the sights. Neat little trolley! Only complaint would be check-in process was not very organized and confusing. Castle had great views. Suggest adding another stop at a historical monument, etc - I would have paid more although you did see a lot in the ride!